Synopsis: 20-year-old Michiru Amatsuki moved to Tokyo due to a change of career. She decided to live in a woman-only share house "Stella House Haruno" with people of different age and occupations. It's always fun when there's delicious alcohol and meal!! 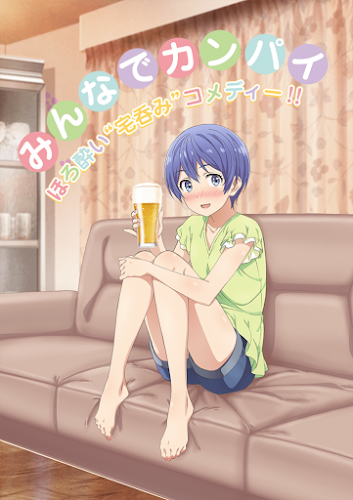 Takunomi is interesting.... reminds me of that Bartender anime, each ep is titled after a drink... and they have delicious food matched for it. Takunomi (Drinking At Home): Plot Summary: Michiru Amazuki is a 20-year-old woman who moves to Tokyo for a new job. She moves into Stella House, a share house for women. Her housemates all have widely different jobs and ages, but as long as they have alcohol and delicious food, everything turns out fine. as i enjoyed ep'2 drinking a whisky highball for the MC's 1st day at work, i find funny their warning to start... if most girls here look younger than 20 like New Game, surely a sign of modern anime yet getting drunk underwater in OP?! 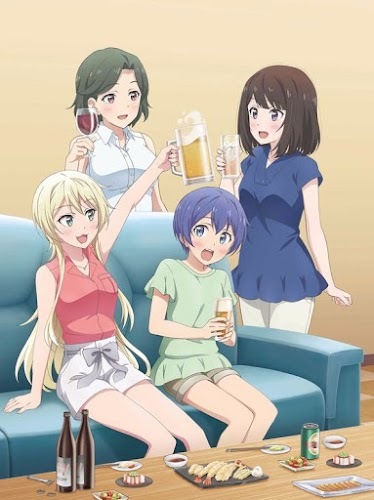 As I said, this one reminds me of 'Bartender'.... each week a new drink is focused on... giving us a short history of it etc.... and they are filling out the character's storylines.... haven't seen the last ep yet.... it is SoL otherwise... which I like... laid back like "Yuru Camp".... which is educational as it entertains as well.... learning about camping in that one. Yeah, Bartender was more adult... for an older audience... this, like most animes, target the age of their MCs... young/er women... and pretty much, it's mostly them getting home to enjoy a different drink of the day/night... This has got to be supported by the industry... at least those liquors being presented... really nice advertising for them... quite great way to sell your product.... I forget what they call this product placement... maybe that's the term? direct insertion into the storyline is common, well, sometimes... but you have to pay for it... but I've never seen it done this well... I don't remember them dissing anything, just promoting those featured in that ep... those companies have to love this. They could show these eps online that advertise their product or have links with those scenes featured on the anime sites... which want/need the financial support... so 'win-win'! Each gives us a little more characterization, but 'just enough'... not so much that it gets in the way of showcasing the drink of the week! Very interesting. I wonder what it's time slot is? Ah, the drinking show is over.... these half eps work rather well... as it seems a rather excellent commercial for the drinking industy... the source material is ongoing, so I'd expect another season. The writing works well for this genre... is it a genre? Nice characters, nice explanation and history of the drinks.. sake, beer, mixed... what's not to like?